Call to Arms: Horses & Mules contains information on how to more accurately use horses, mules and other equids for transport, roleplay information including a horse personality generator and glossary of horse colors, information on when and why you might want a mule rather than a horse as well as stats for new horse “types.” You will also find horse-like monsters and mounts, and examples of “mythic” and “artifact” horses, some of them new to this book. It draws on real life horse knowledge as well as mythical horse-like creatures from around the world. 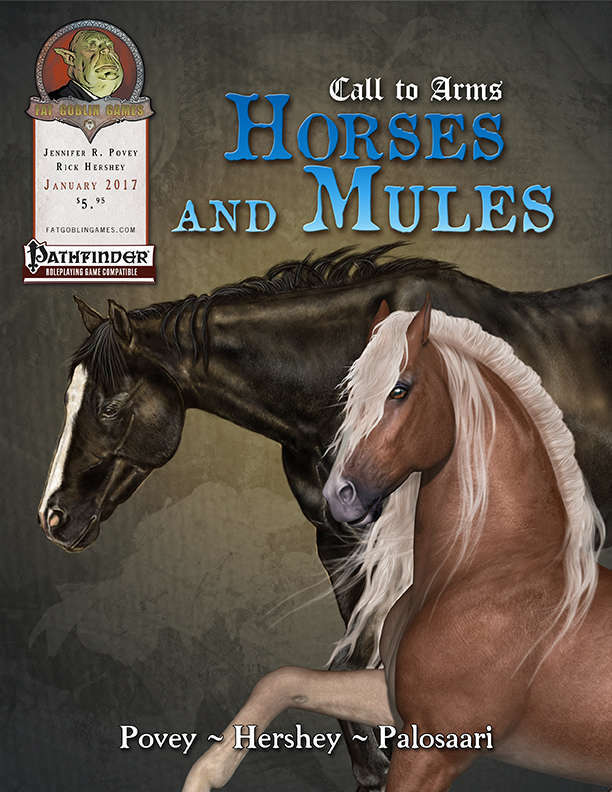 Horses & Mules is for the GM who wants to make overland travel more realistic and a key part of the game as well as players of mount-focused classes, such as the Cavalier or Paladin. Horses are a vital part of Medieval-style and other low-tech settings and this book will help you do more with them than tie them up at the dungeon entrance and hope they are still there when you get back.